It’s once again time for our tongue-in-cheek roadmap of what’s in and what’s out in investor relations, and more, for the upcoming year. We hope you enjoy, and have a happy and successful 2015. Let them know! Let them know! Let them know! I recently moderated a webinar hosted by NIRI on social media strategies for investor relations. On the panel with me were David Jackson, CEO, Seeking Alpha; RJ Jones, Investor Relations Officer, Zillow; and Andrew Shapiro, Founder, President and Portfolio Manager, Lawndale Capital Management. The discussion made clear that professional investors are using social media - activists included. In addition, all public companies should have a social media strategy, even if the objective is just to monitor the online conversation. Time to Revamp the Quarterly Earnings Call? And the Award for Best Quarterly Earnings Results Conference Call goes to…. Giving awards to recognize production of an earnings call may be a little premature, but several companies are spicing up what is generally considered an uneventful quarterly ritual by the investment community. It is encouraging to see companies embracing the use of new technologies and social media for investor relations. Before you follow their lead, we can’t forget what is truly important to our key stakeholders about the process: transparency and access to management. As you may have heard, the SEC has stated that public companies may announce material, non-public news on social media outlets like Facebook and Twitter, provided that companies take appropriate steps to alert investors which outlets they will use. Depending on your perspective, that may sound either intriguing or daunting. But if that’s as far as it goes for your company – a quick reaction followed by little else – then all of the recent discussion spawned by the SEC’s ruling will have been little more than a wasted opportunity. Sharon Merrill and the law firm Sullivan & Worcester recently co-hosted an educational seminar with investor relations and corporate communications officers on using social media for public companies. We presented an overview of the legal issues related to using social media for disclosure purposes, and we also provided six building blocks for developing an investor relations social media strategy. 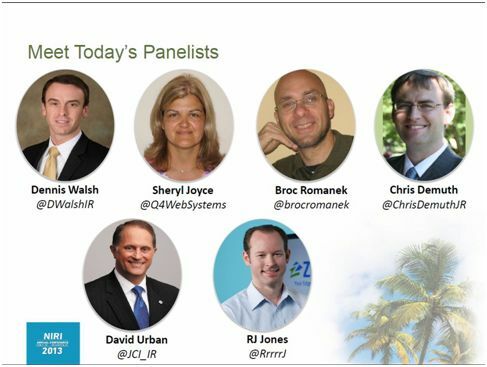 *Okay, so I may be biased since I was the moderator, but this panel session at the NIRI’s 2013 Annual Conference had all the elements necessary to help IR professionals develop a strategy for using social media for IR. Attendees heard from David Urban, Director of IR at Johnson Controls; RJ Jones, IRO at Zillow; Broc Romanek, editor at TheCorporateCounsel.net; Chris DeMuth, portfolio manager at Rangeley Capital; and Sheryl Joyce VP Marketing & Communications at Q4 Websystems. The key take away from the panel was that IR professionals should take control of or insert themselves into their company’s social media strategy. Since marketing and PR departments typically "own" social media, the challenge for IR departments is twofold: 1) ensure that all activity is compliant with public company regulations, and 2) ensure the messaging is consistent with the overall IR strategy. The SEC finally has provided guidance on the use of social media for investor relations. The guidance came in a report on its investigation to determine whether Netflix CEO Reed Hasting had violated Reg FD. In a Facebook status update on his personal account, Hastings said Netflix had streamed 1 billion hours of content in June 2012, calling into question whether the post was selective disclosure of material information. In its report, the SEC clarified that companies can use social media outlets like Facebook and Twitter to announce key information in compliance with Reg FD. It’s the moment we’ve all been waiting for, but with some key caveats. I recently participated as the designated “social media expert” as part of a crisis communications case study session at the 2012 NIRI Southwest regional conference. This year’s conference was held in New Orleans and the session centered on a fictitious publicly held bead manufacturing company (apropos for the conference host city) that found itself suddenly facing a major environmental crisis. During the true-to-life exercise, attendees took on the roles of the company’s corporate communications officers and were tasked with implementing all aspects of the crisis response plan. In their new roles, the attendees had to make a number of decisions relating to the immediate actions of the fictitious company, “Beignet Beads & Baubles.” For example, should the company proceed with a press conference with the governor announcing a state grant that afternoon? Should management go forward with a scheduled presentation at a major investor conference in New York the next day? Should a planned announcement of a major plant expansion be delayed? As typically happens with a real crisis, the Beignet Beads & Baubles “crisis team-for-a-day” was given an increasing amount of information to complicate their decision-making process. It’s that time of year again: Back to School! For my first job out of college I worked as an educator. This year, for “Back to School” season, I thought I’d step back into my teaching shoes. The following is a quick lesson on social media for investor relations for the marketing and public relations professional. Technology is constantly changing the way we engage with our audience, so professional communicators must never stop learning new techniques. As a seasoned marketing or public relations professional, you’ve likely got social media covered. But how fluent are you in investor relations best practices? If you work for a public company, you might want to rethink your social media engagement strategy.